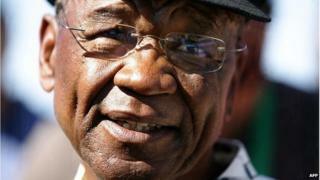 Image caption Thomas Thabane told the BBC's Focus on Africa he still had it in him to "go to the hustings and campaign"
Lesotho's Prime Minister Thomas Thabane has told the BBC he will contest next year's elections, which were brought forward after an alleged coup attempt. He said he no longer had any issue with the army, despite having earlier accused it of trying to oust him. The vote is to be held in February 2015 - two years early - in an effort to resolve the crisis between rival parties in the coalition government. The power struggle is believed to have polarised Lesotho's security forces. Mr Thabane is reportedly supported by the police, while Deputy Prime Minister Mothetjoa Metsing is said to have the loyalty of the army. Mr Thabane has headed a unity government since elections in May 2012. However, he suspended parliament sessions in June to avoid a vote of no confidence amid feuding in his coalition. In August, he briefly took refuge in South Africa after accusing Mr Metsing and the army of plotting his removal. He returned in early September, escorted by South African police. On Thursday, South African Deputy President Cyril Ramaphosa, who has mediated in the crisis, announced the early elections. He said the exact date in February 2015 would be decided by Lesotho's King Letsie III. Mr Thabane told the BBC's Focus on Africa programme that the time had come to "go back to the electorate and get a fresh mandate". "I still have it in me to go to the hustings and campaign," he added. Lesotho, which is surrounded by South Africa, has experienced several coups since independence in 1966.